Mother Nature Landscaping is a full service, award winning group of landscape and irrigation contractors. Based in Bloomington, Indiana, Mother Nature has served both residential and commercial properties within Central Indiana for 20 years. Mother Nature's dedicated and qualified craftsmen take pride in each and every step of the job beginning with a professional design consultation. Our landscape contractors will bring the design to life with beautiful hardscapes, such as, patios, walkways, retaining walls, and garden structures; water features, such as, ponds and waterfalls; and the highest quality flowers, trees and shrubs. The irrigation specialists will make sure that all of your plantings will remain healthy and vibrant. And our landscape maintenance staff will keep your entire landscape looking its best. Established in 1965, Bloomington Valley Nursery is a well rounded landscape supply company that offers solutions for your landscape needs such as; trees, shrubs, bulk mulch, soil amendments, perennials, bulbs, top soil, Japanese koi and other water garden supplies. Also visit our garden center for unique gifts and gift certificates. Our staff includes a LEED Accredited Professional Landscape Designer with a bachelor of science in landscape architecture from Purdue's nationally ranked program who is ready to create your outdoor living space. BVN's staff also has many specialists, including a nurseryman with over 40 years experience, to assist you in choosing the correct materials if you are taking on a project yourself or to answer any of your horticultural questions. Shawn Eurton is the owner of Mother Nature Landscaping and Co-Owner of Bloomington Valley Nursery. He attended Ball State University and earned his Bachelor Degree from Indiana University in 1995. In 2009 he was recognized by the Indiana Nursery and Landscaping Association as an Accredited Horticulturalist and has been certified by the Indiana State Chemist since 1995. Shawn has over 25 years experience in the landscape and nursery industry and currently oversees operations for both Mother Nature Landscaping and Bloomington Valley Nursery.Shawn and his wife Kara grew-up in New Albany, Indiana and upon graduation from I.U. remained as residents in Bloomington. They are the proud parents of three beautiful girls. Kaylee, Riley and Kendall. They enjoy traveling, boating on Lake Monroe, fishing, riding their 4-wheelers and horses, going to I.U. athletic events and gardening at their home. A perfect day for the family is one spent outdoors. Seth Inman is an Indiana Accredited Horticulturist. PLANET certified Hardscape Installer and holds a 3b Pesticide Applicator License. Seth has been with Mother Nature since 1997 and acts as lead foreman. He is also co-owner of Bloomington Valley Nursery. He is a trade school graduate studying Forestry and Landscaping. He has extensive knowledge of native and non native plants and his botanical passions lie with dwarf conifers and Japanese Maples. Seth was foreman over an extensive hardscape project that won the Indiana Concrete and Masonry Association Award of Excellence. 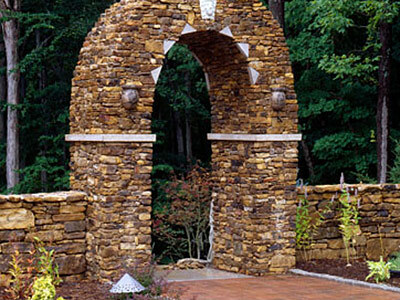 His landscape designs and installations have been featured in the local Hoosier Times and Bloom Magazine. Seth was designer and installer of a "Best Water Garden" award issued by a panel of his professional peers. He also donated, designed and installed the landscape for the Tibetan Multicultural Center where the Dali Lama resides during his visits. Seth is an avid speaker and has talked on topics ranging from water gardening ecosystems to creating colorful containers with annual and perennials for schools, garden clubs, and other organizations. Seth was born and raised in the Bloomington area and graduated with his wife Laura from Edgewood High School. He has two children, Bella and Lucas. They all share his love for gardening. Seth enjoys the arts and is an avid reader. Much of Seth's personal time is spent outdoors with the family on day hikes, taking in the local eats, and enjoying all of the other wonderful diversities that make up Bloomington, and of course maintaining his own landscape. Josh is a Landscape Designer / LEED accredited professional with a Bachelor of Science in Landscape Architecture from West Virginia University. His experience includes site planning, graphic design, residential/commercial landscape design, storm water management and sustainable design practices. Josh is actively involved in all phases of landscape projects for both Mother Nature Landscaping and Bloomington Valley Nursery. His training and experience in landscape design has allowed him to become a very integral part of both businesses and is able to assist clients in every facet of our projects. Bloomington Valley Nursery: Our crews at BVN have years of experience in providing you with your plant installation needs. Our staff can show you the best location on your site to plant certain species and then take the time to plant the species at the correct depth while providing all the necessary soil amendments and planting accessories to help your plants flourish in their new home. The crews also have the horticultural knowledge to answer any questions you may have regarding the care and maintenance for your new landscape. Not interested in maintaining it yourself? Simply let us know that you would like to be put on a maintenance schedule and we can keep your landscape looking great for you. Our Garden Center and Nursery Staff have a combined 100 years of experience in growing and maintaining Nursery Stock. Our perennial specialists will help you in deciding what plants will suite your needs based on color, sun/shade requirements, aroma and how much maintenance you desire to put into your garden. Our Nursery Staff can answer all of your questions regarding tree and shrub selection as well as provide you with planting and care instructions. Take a stroll through our Garden Center where our Manager can provide you with all of the garden essentials to keep your landscape flourishing throughout the year. We have purchased "Invisibile Fence". Supplies can be purchased at our Garden Center.